In my last moments as Chair of the Ontario Medical Association Board, I thought of the five remarkable doctors, my former colleagues on the Executive Committee ,who have been my inspiration for the past six months. They embody the compassion, devotion and civility that epitomize physician leadership. I have learned so much from them. Like my colleagues, despite having Council’s confidence to continue personally, I found the vote of nonconfidence in the Executive Committee in general to be extremely troubling. As much as I want to assist in mending the divisions within the Ontario Medical Association, I believe that the best thing I can do is to assist as a Board member for a few more months. The past six months have also taken a toll on those who care most about me and my clinical work so I feel it is important to attend to the interests of my family and my patients. I am first and foremost a doctor and nothing is more satisfying to me than watching the life come back into a young person’s face as their depression lifts. I am inspired by the clinicians that I work with in my hospital and my community. The doctors and nurses, psychologists, social workers and other clinicians in my hospital keep me grounded in what is most important in medicine. They are amazing. In ten years of medical politics, I have learned that I am not a politician. I can’t learn the lines or follow the cues. As too many people tell me, I cannot keep my facial expressions under control. If I have had any success, it is because I am persistent. It is because my efforts to be tolerant and gracious and kind have occasionally been successful. It is because, having always worked with youth, I have learned not to take my self too seriously. The picture below is my favourite picture of me in OMA service. 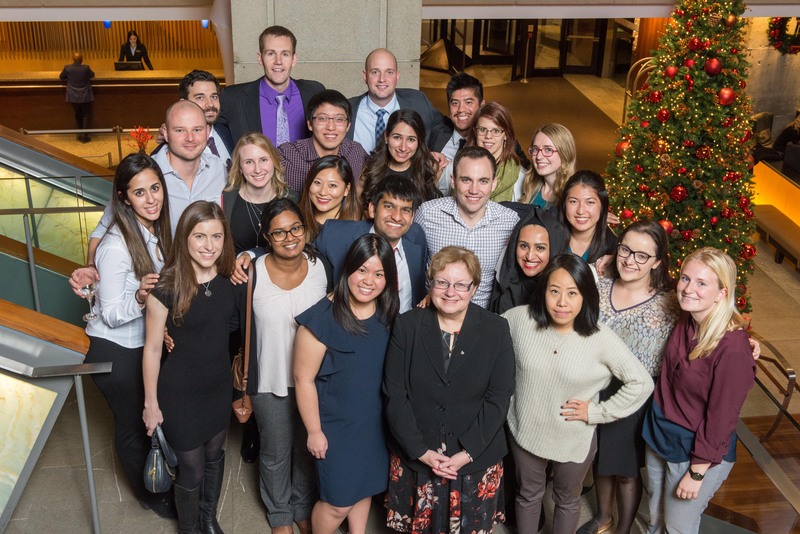 This was taken last November with Ontario’s medical student leaders. On the days when I have the most worries about where we are headed, I think about these doctors-in-training and I am reassured. If the work I have done for the Ontario Medical Student Bursary Fund and Physician Human Resources have had an impact for one young doctor, then my time at the OMA Board has been well spent and I leave with a light heart. Gail, it has always been pleasure interacting with you over the years. Thanks for all your service to our profession, and for your interest in all that I have been involved in when I was working for the OMA. Also, thanks for supporting my writing efforts and vision.. very much appreciated. As Brenda Zimmerman taught us in PLDP, from every forest fire there is new growth, and flowers from the ashes are often the first thing to surface… I am sure you will be one of those!! Cheers and enjoy some personal time. Gail, you should leave with a light heart. And a healthy sense of pride and accomplishment. I and countless others appreciate your work, your achievements, your integrity, your perseverance. Over years. And we admire your dignity. You and Atul have brought to mind Teddy Roosevelt, whom I quote (with some gender neutralization editing to better suit the modern era) here: It is not the critic who counts; not the man or woman who points out how the strong woman or man stumbles, or where the doer of deeds could have done them better. The credit belongs to s/he who is actually in the arena, whose face is marred by dust and sweat and blood; who strives valiantly; who errs, who comes short again and again, because there is no effort without error and shortcoming; but who does actually strive to do the deeds; who knows great enthusiasms, the great devotions; who spends him/herself in a worthy cause; who at the best knows in the end the triumph of high achievement, and who at the worst, if s/he fails, at least fails while daring greatly, so that her/his place shall never be with those cold and timid souls who neither know victory nor defeat. Thank you, Gail, for your sincerity, your grace, your principled approach, and your longstanding dedication to the profession. It is wonderful to hear how you derive strength and passion from patients and our learners. Your heart is in the right place, and it shows. Best wishes. It is with gratitude for all you have done and continue to do for the delivery of high quality health care that I write this. You are a respected leader whose qualities of grace and civility will be missed by the membership. Thanks for your grace and hard work. Your sincerity and passion and beyond question and reproach. Thanks Yoni, I have had a unique opportunity to serve the profession and my patients. I have also met any doctors like you are making a real difference in healthcare – it’s been great! Thanks for your service. I cannot imagine how difficult the last few months have been for you. You are a great doctor and patient advocate. We have not seen the last of you, I’m sure. Thanks, Scott. One of the interesting unintended consequences is how much I have continued to learn in other areas of medicine. I have also met so many amazing colleagues. I hope our paths cross again soon. ← Patient Accountability: Is it reasonable?